In response to this, both representatives of the Church of Saint Demetrios in Agrinio as well as the Metropolitan himself made separate announcements seeking to clarify the matter, which created a huge scandal in Greece. Below are the announcements translated, as well as videos from the vigil. In recent days there has unfortunately been observed a variety of critical and derogatory comments regarding the vigil that took place on 11 July 2017 in the Holy Church of Saint Demetrios in Agrinio in honor of our Venerable and God-bearing Father Paisios the Athonite, which resulted in many Christians becoming unwitting victims of distortions in certain journalistic circles both of Saint Paisios and the Church of Saint Demetrios in Agrinio. - In the invitation of the church for the vigil, published on 8 July 2017, there was no mention that there would be a chestnut for veneration. Consequently, the faithful did not come to venerate a chestnut but to participate in the vigil and honor Saint Paisios the Athonite. - The chestnut was given among other things as a blessing to a group of students by Saint Paisios in October of 1990. There has never been an issue about this since then, though many people have seen it very many times before. Besides, it is mentioned by Metropolitan Kosmas of Aitolia and Akarnania in an older work of his on Saint Paisios. - The vigil was done outdoors, next to the plane tree where Saint John the Vrachorites was martyred. Under this plane tree Saint Paisios, as a soldier in Agrinio, sat almost every evening and prayed, as he himself informed pilgrims to Mount Athos that visited him, who had come from Agrinio. 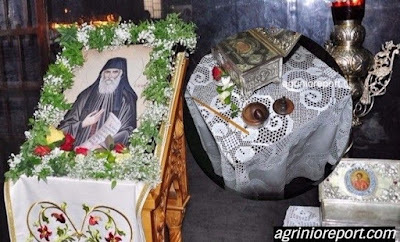 - The main exhibits throughout the vigil which were exhibited for veneration were the icon of Saint Paisios and the relic of Saint John the Varachorites, since this was the place of his martyrdom. - During the vigil, many people knew of the existence of the chestnut, and they asked to see it. Therefore it was exposed after Vespers (not throughout the vigil) with the purpose of being seen by the people how it has remained unchanged, with its fruit still being heard. It has never been said or written in a statement that the chestnut is sacred or miraculous. 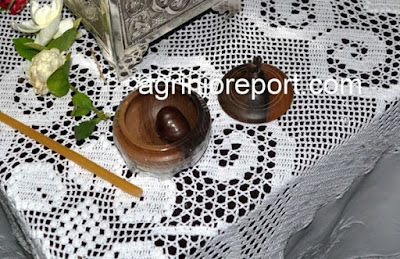 - None of the thousands who participated in the vigil showed any reaction against the exposure of the chestnut, as of course it has never before happened all the other times in the past when it was presented in various circles, whether they be in catechism classes, Christian lessons or homilies in the Church of Saint Demetrios in Agrnio. A pious journalist covered the vigil, responsible for a news site, who took a video of the vigil and posted it on 12 July 2017 in an article on her site, as well as a photo of the chestnut, noting its history in the article. 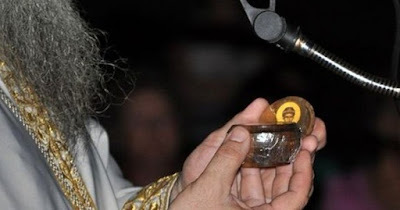 Being present at the vigil, she stated in her article that "the faithful who came forward to venerate the icon of the Venerable and God-bearing Father Paisios the Athonite, and the relic of Saint John Vrachiorites, as well as to see up close a chestnut which Father Konstantinos Kantanis said, was given here 27 years ago with the blessing of the Athonite Paisios to him, when he visited him as a student in 1990. It is worth noting that the chestnut after 27 years remains in its original condition." "I am also not tempted to deal with the whole matter as a great business of a Saint who was an elder and spoke more national patriotic quotes than words of love. But honestly, a monk who leaves a year of his monastic life to marry off his sisters, is he a hero by this? Why does he need to give a chestnut that is time-honored to a priest anyway? An elder who during the civil war was a 'radio operator of God' and captured by the communists who put him in a cell with two rebels almost naked and he by the grace of God did not react at all, what else is needed to prove he was a Saint? I'm asking a question." Further, in a comment under the main article, the author of the article writes: "I want to tell you that I firmly believe that the ascetic Elder Paisios became so popular for a reason: because it operates as a counterweight to the founder of the Bulgarians, the Paisios whose image is even on their coins. He learned letters at Mount Athos, and essentially 'created' Bulgarian letters, the Bulgarian consciousness, and ultimately Bulgarian nationalism, which the Greeks have confronted many times. This other Paisios, you will know, created an entire other culture of people at Hilandar Monastery! Therefore, in the consciousness of our people, we wanted a Greek version of the name Paisios." We also wanted to inform the Christian fullness that the Church of Saint Demetrios never presented the chestnut to "solicit" the faithful or for the worship of him, but presented it to simply show that it has not been altered after so many years. It was not exhibited throughout the entire vigil but only at the end of Vespers, and only then at the demand of the people who wanted to see it. Consequently, the chestnut was by no means the cause of the created issue but it was used by certain journalists to raise the issue and ridicule the memory of Saint Paisios, which unfortunately results in many Christians falling victim to deception perpetuated against both Saint Paisios and the Church of Saint Demetrios in Agrinio. On the eve of 12 July 2017, in memory of our contemporary Saint Paisios the Athonite, there took place Sacred Services and Vigils in many holy churches of our Holy Metropolis of Aitolia and Akarnania. 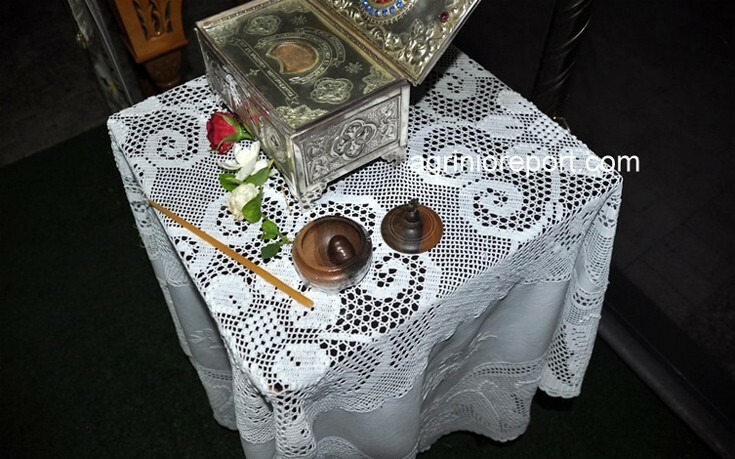 A Sacred Vigil also took place in the adjacent area of the Holy Church of Saint Demetrios in Agrinio, at the Chapel of Saint John - the place of his martyrdom. The Holy Metropolis of Aitolia and Akarnania, with grief and pain has monitored the turmoil and disorder among believers, which arose out of an object of blessing from Saint Paisios, in a false report of its veneration by the faithful. With much love and understanding we listened to the protests of the faithful people, who are in confusion, and rightly worried. Many times love and respect for our Saints, leads to extreme respect for their objects, which certainly are a particularly personal blessing, but they are by no means equal to Sacred Relics and wonderworking Icons, which are actually parts of the very bodies of our Saints or they depict their sacred faces. We pray that you all remain faithful to the Dogmatic Teachings of our Holy Church, which even for the Sacred Icons of the Saints teaches that they are the sensible medium between the faithful and the prototype, who is unseen to them. "An icon is one thing and the one who is portrayed is another," says Saint John the Damascene. The Holy Metropolis of Aitolia and Akarnania, with great esteem, reverence and respect for the honor of the Saints and their Sacred Relics, distributes from them, as is beneficial, every blessing that comes from them as an important means of spiritual teachings, as Basil the Great says of Icons: "What the spoken account presents through the sense of hearing, the painting silently shows by representations."